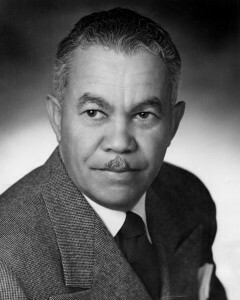 Paul Revere Williams practiced largely in Southern California, building residences as well as commercial and public buildings. A favorite of celebrities, he designed homes for Cary Grant, Frank Sinatra, Lucille Ball and Desi Arnaz, Zsa Zsa Gabor, Anthony Quinn, and Barbara Stanwyck. Orphaned at age four, Williams attended the Los Angeles School of Art, where he excelled in drawing, and University of Southern California, School of Engineering. He was certified as an architect in 1921 – becoming the first African-American licensed architect west of the Mississippi. In 1923 he became the first African-American member of the AIA (American Institute of Architects). Williams won an architecture competition at age 25, and opened his own office three years later. He served on the board of the Los Angeles Planning Commission in 1920, and worked for architect John C. Austin from 1920 to 1923 as a draughtsman. By the early 1930s, his own designs—bolstered by his elegant rendering style—were acclaimed in their own right. Six years after opening his practice, he was commissioned to design a home by horse racing entrepreneur Jack Atkins. In 1930 he was approached by E.L. Cord, maker of the Cord automobile, to build his Hollywood residence. Williams was soon known as “architect to the stars” as his portfolio of notable clients grew. Through the first decades of his career, he was acclaimed as one of leading architects of the Spanish Revival movement in California. Not limited to any particular aesthetic or building style, Williams went on to excel in midcentury modern design, working in both curvilinear form in the Theme Building at Los Angeles International Airport (1961, with Pereira & Luckman Architects) and the rectilinear designs favored by other midcentury modern architects. Williams first residential project in Palos Verdes was Williamsburg Lane in Rolling Hills, completed in the 1930s offering early-American style homes. Thirty years later, Williams returned with a more ambitious project. SeaView Palos Verdes, begun in 1960, was a modernist option to tract housing, offering eight designs that could be flipped to create 16 possible floor plans. With a wealth of interior finishes in the styles of the day, the buyer approached custom design on a reasonable budget.